Choosing a WordPress theme can be one of the most time-consuming and frustrating areas of the WordPress experience. This is what you should be asking yourself when choosing a WordPress theme. Creating and maintaining a website is easier if there is only one single purpose for it. Are you trying to collect email addresses? You may consider themes with a prominent signup box on the homepage. Are you trying to build a brand within a niche as a blogger? 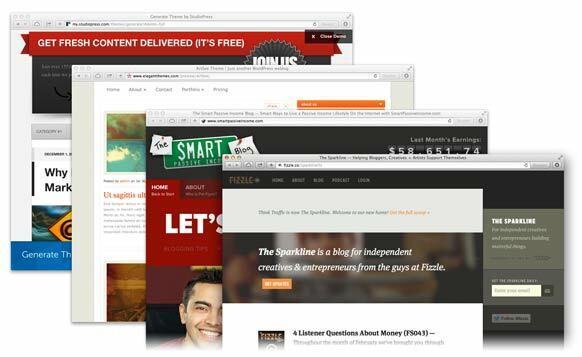 You could opt for an attractive arrangement of featured posts on the homepage. Are you building a blog for a business? In which case, you may like a theme with a more corporate look. Try to go for simple looking themes at first. Remember they can be customised later to further emphasise your website’s purpose. What themes fit with your niche? Choosing a corporate look for a blog about children’s toys would be a mistake. But, again, I would urge you to choose a minimal looking theme that can be customised later. Above all else you will want to choose a theme that is reliable and has good support. The last thing you want is your theme breaking with the next WordPress update and then get zero response from the theme’s creators when you try to fix it. I am unashamedly pro-Genesis. I really believe a premium theme is a small investment to make when you consider the benefit you’ll get with the reliability, support and ease of use. In addition to Genesis here are some other reliable well supported themes. The above themes are so well-established and well-supported within the WordPress ecosystem, that it is easy to find developers that specialise in these particular theme frameworks on oDesk or Elance. They can customise your website so it can look and act in exactly the way you want it to. All the above links are affiliate links. If you make a purchase through one of them I will be paid a commission. It’s perfectly okay to google them and buy them that way. Feel free to ask me any questions about this or anything else. Is there a blog you particularly admire in your niche? If so, write to the blog author, tell them how much you like their site (that’s a good thing to do anyway), and ask about the theme. They may have had one custom-built but they could still help you with a bit of advice. I would not consider a theme if it didn’t have the following properties. Over 50% of the worlds webpages are currently being viewed on tablets or mobiles and this will increase in the years to come. Therefore it is essential that your theme is responsive to all sizes of devices. When viewing a theme’s demo, resize your browser window to a couple of inches wide and back again to see how it responds. Threaded or nested comments are those where you and your readers can reply to the comments – and the replies are indented or otherwise visually different to the first level comments so it’s obvious a conversation is taking place. This coupled with a comment subscription plug-in, can engender a real discussion group after each post. This creates a feeling of community around your blog as well as awesome user-generated content. Not essential if you don’t want drop-downs in your top navigation bar. But a theme sporting menu drop-downs on it’s demo page is the sign of a well-loved theme. If you really, really want to save money (Genesis with the free sample child theme is only $60) and go for a free theme, I would recommend you choose one of the themes that come with the default WordPress installation – Twenty Thirteen or Twenty Fourteen, for example – and then create a child theme of the default theme’s parent. You can be assured of the quality of these themes as well as of support through the WordPress forum. 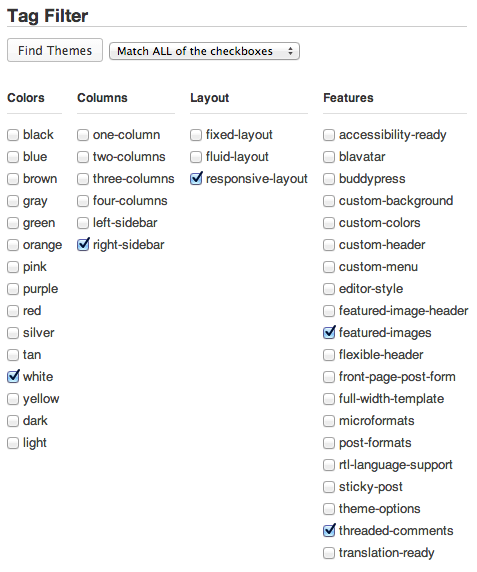 WordPress has a new tag filter in their theme directory. I would start off with the following checked. 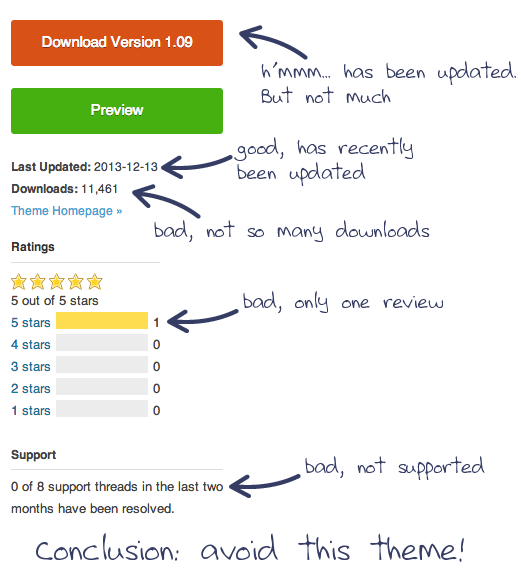 When choosing a theme from the WordPress theme directory, always look at the theme’s ratings on the right hand side of the theme’s page in WordPress. There’s some great information where you can find out if your chosen theme is well-loved or not. Use common sense here. There could be a great theme with only one review because it’s new and hasn’t seen the light of day much. But, that’s unlikely. Generally speaking, avoid themes that look badly-supported and poorly looked after as they will more likely conflict with plug-ins and break with WordPress updates. 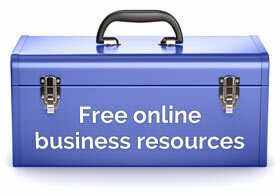 Here is a recent list of free WordPress themes. Whether you go for free or premium, choosing a theme is something we’ve all struggled with in the past. I really do recommend going for a well used and well supported premium theme framework if you can. Your initial small capital outlay will be more than compensated by the ease of use and customisation. But, what do you think, what other things do you think about when choosing a WordPress theme? What theme are you using at present? Did you go for free or premium? What issues are you having with it, if any? You can also try services like http://whattheme.com to see what themes other blogs are using and grab it for your own website. WordPress themes roundups are also a good source of inspiration. Hi Rob, thanks for the article. I tend to agree with you on those guidelines. I must admit I don’t know much about ‘child themes’ though, so do you have any words of wisdom here? Thanks in advance. Compared to the start-up costs of any other business, especially offline ones, I always find it shocking that people are not willing to invest just a bit of money to really build their credibility. For example, a custom theme vs a free one or self-hosting WordPress vs Tumblr or Blogger. And like you said, I am a big fan of Genesis – great structure, layout, SEO settings out of the box, etc. Hard to beat. You’re right, Gary, $60 for the Genesis framework is such a small investment when you consider all the structure, SEO and ease of use benefits you get. As you say, your website is central to your online credibility so this small investment and other’s like it are not too much. Good post! Just in the near future I plan to change the template of my site! I don’t know about Elegant Themes, the subscription package they have can be called a bundle. But overall I am not to satisfied with what I need for my blog/website. Also, my personal opinion before choosing a theme, you should do a survey to see the pro’s and con’s regarding. I had some surprises with a theme forest theme. I know how it is. To be honest, I went with Genesis over three years ago and I’ve never looked back.